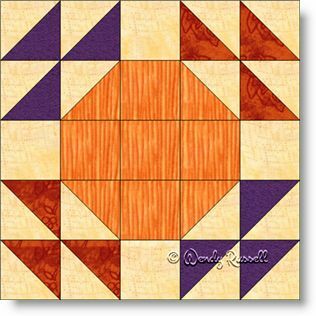 The Desert highway is a simple block using the most common quilt patches -- the square and the half square triangle. I have chosen to construct this block as an uneven nine patch, simply because I am not a fan of sewing individual rows together. However, do not hesitate to construct your block in rows if that is your preference. The sample quilts illustrated give you some idea for how to make your own personal heirloom. Layouts shown are set on point and blocks side by side. However, don't be limited to these examples. There is no end to the way you can create your quilt.